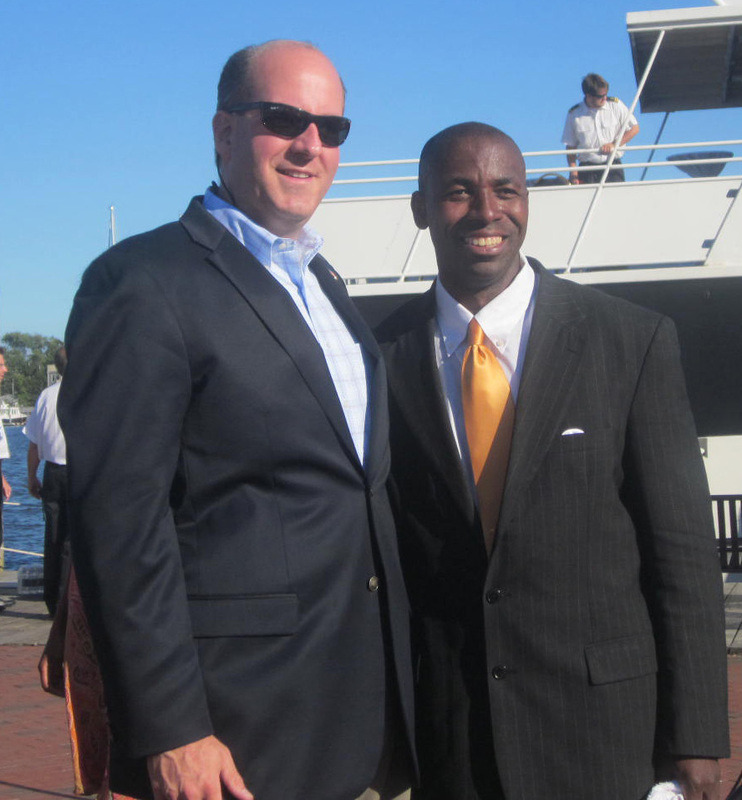 Charles Lollar, right, with supporter Jerry Walker, chairman of the Anne Arundel County Council. Charles Lollar at Annapolis city dock. Two faces of the Maryland Republican Party appeared just a few miles and a few hours apart in Ellicott City last week. On Wednesday afternoon, Charles Lollar was dishing out his energetic, nonpartisan outreach to several dozen enthusiastic supporters in pink and blue “Achieve the Dream” T-shirts as part of his four-day statewide mini-bus tour launching his run for governor. Three hours later, a group of mostly older establishment Republicans gathered to hear Bob Flanagan announce a run for delegate, the post he held for 20 years before Gov. Bob Ehrlich tapped him to be transportation secretary 10 years ago. Barely noticed in the small crowd was Harford County Executive David Craig, the GOP candidate for candidate for governor with the most solid experience and the least pizzazz. It’s not exactly fair to compare Craig’s innocuous presence at someone else’s political announcement with the campaign rally of a rival, but if Lollar had been in the room, he certainly would have made himself visible. Lollar, a tall muscular Marine major with a command presence, taps into the Tea Party anti-tax fervor and anyone looking for an alternative to the current Democratic establishment or the Republican one, for that matter. Lollar’s slogan unabashedly evokes Martin Luther King Jr. “That dream has everything to do with prosperity, opportunity and social justice,” he said. In both Ellicott City and Annapolis on Friday, and one presumes elsewhere on the dozen stops of his tour, Lollar told a story about greeting a woman at a Labor Day parade. She dissed him when she found out he was a Republican. “I know Dr. King had a dream, but you’re not it,” Lollar said she told him. Wince. He also seemed to reject running on the social issues so popular with some on the Republican right. “I’m certainly not running to be your priest, I’m running to be your governor,” Lollar said at several stops. Lollar still has plenty of time to refine his message. He has a strong team of committed supporters, and opened a campaign office in the same empty Annapolis office building the Ehrlich campaign used in 2010. Craig also has months to raise the energy and visibility of his campaign. He needs to share some of Lollar’s fire. UPDATE Monday noon: Del. Ron George of Annapolis is in the GOP race for governor, but he wasn’t in Ellicott City last week. Massive turnover in the legislature is expected in the 2014 election, with at least a third of the 188 Maryland General Assembly seats changing. Nowhere is the upheaval more dramatic than in Howard County, where two-thirds of its seats are up for grabs: two of three Senate seats and six of nine delegate seats.